from private clients and companies and organisations, and international mental health experts who use my materials. Engaging presenter, great pitch, informative; got take away and learnings to apply at home and work. This was a super workshop delivered with a very relaxed, effective style. Veronica used examples of situations everyone in the room could relate to. Excellent. Very interactive and interesting presentation and workshop. Veronica is a great facilitator. Fabulous speaker, very engaging. Loved it! Enjoyed this workshop. Very interesting + lots to takeaway from the session. I enjoyed the workshop and would recommend it. Great job and so many useful tips and tricks. Feel empowered! Thank you very much! Veronica was excellent, engaged, superb presenter! Found the theory, skills and application very useful and I know I will use it in work and personal situations. Brilliant – throughly enjoyed this session. Will definitely bring the learning with me. Love the presenters ‘style + poise’. Thanks Veronica! 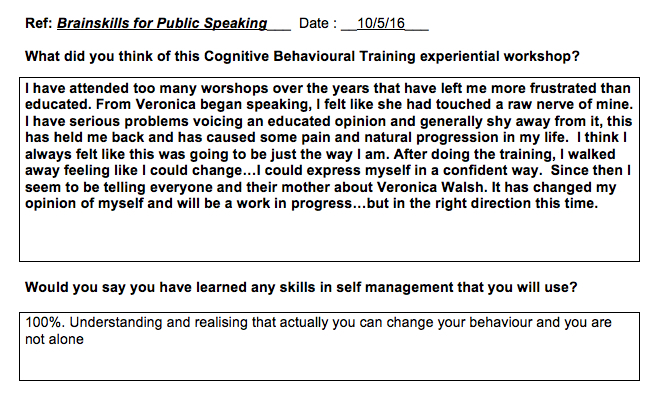 Veronica Walsh recently completed one to one CBT sessions with a number of our clients. These clients had reached a certain point in their lives and their recovery from addiction and were unable to move forward. This left them struggling to commit to attending anything that might help. Veronica worked with these clients where they were at and tackled their individual blockages with them. She taught them strategies to recognise and overcome similar situations if and when they should arise again. Client attendance for the 5 week Programme was 100% and all clients have since expressed an interest in continuing this work. The insight into their self-sabotaging thinking has empowered these clients beyond recognition. I think that these results speaks volumes for her work, her understanding of people and her empathy for them and her commitment to facilitate change in their lives. Hope life is peachy for you. Since you’re so wonderful at what you do, I wanted to send you a testimonial to use on your site if you like. And it only took me three months to sit down and do it, fair play to me. That’s it! Thanks again Veronica, I’m a new woman – but still entirely mad, of course. “Veronica Walsh presented Mind Mapping to a staff group from three organisations and delivered an interesting and stimulating session which captured the basics of visual note taking and presentation in a half day event. I’m a psychologist in Philadelphia, PA, USA. I’ve been in practice for many years and have had the privilege to attend workshops with Tim and Judy Beck at the U. of P..
I’ve created and used many CBT and RET oriented handouts with clients. I must say that I find your handouts to be among the best I’ve seen. Per your request, I would very much appreciate your permission to duplicate and utilize some of them with my clients. I assure you that they will be used appropriately and with acknowledgement of their source. Veronica is engaging, inspiring and compelling. A breath of fresh air, we highly recommend her for staff development. Thanks for a clear intelligent blog. I particularly enjoyed the references to Epictetus and Shakespeare. I’m looking for good CBT blogs to follow in conjunction with our new web-based therapy site, and yours is the best I’ve seen so far. A huge thank you to Veronica Walsh who recently spoke at our Executive PA Forum on Visual Note-taking and Mind Mapping Technique, which went down extremely well at the event. She also delivered a workshop on the Cognitive Science of Public Speaking – her presentation style is highly engaging, she is enthusiastic about her subject matter, and held everybody’s attention for 3 hours. “I can highly recommend Veronica Walsh who was a guest speaker at my first year Critical Thinking and Independent Learning Skills Module at Dublin City University (DCU). Veronica took the class for a seminar on Mind Mapping and Visual Note Taking and her presentation was both stimulating and engaging. The intention was for students to be persuaded of the benefits of visual note taking and to see how they could utilise the techniques for studying, writing essays and more. Due t the ever-present budget constraints Veronica only took one class, but the feedback was excellent and many of the students asked whether she could return. Veronica’s delivery is accessible and the vast majority of students, whether or not they had engaged with the topic beforehand, found her engaging and effective. “Since the economic downturn, the County Library Tallaght has responded to the particular needs of customers who find themselves at a pivotal point in their lives. They may be facing into long-term unemployment or battling for attention in a highly competitive job market. Either way, people have found that they now need a different set of skills to help them manage in this uncertain environment – one which may be troubled by feelings of stress and anxiety. In order to address some of these problems and concerns, we asked Veronica Walsh to run her very popular Coping Skills for Jobseekers course at the County Library in September. Participants were introduced to CBT techniques which empowered them to think about their situation in a different way and face the future with a more optimistic frame of mind. “I’m sorry I’ve not been in touch in a while. I just wanted to let you know that your sessions with me made a really big difference to my particular issue! I’m almost completely free of the dread of flying – the anticipatory element in the lead up to flying – and the flight itself was fine. I’m flying next week and I’m not at all worried about it and in fact even looking forward to the destination. I’ve more flights then to [redacted], [redacted] and [redacted] in May and June. I’d have been dreading that and seeing mid June as the ‘watershed’ when I’d my flying ‘done’ and I could get back to ‘life’! Now I’m actually looking forward to the destinations and am even able to google about them – I couldn’t even bring myself to do this before because of the dread. Anyhow – I just want to let you know how grateful I am to you and to say how skillful you are at communicating all that you do and in putting me in a space where I could listen and also be heard by you. I’m really indebted to you. · Clear + concise approach. Mind mapping is the way forward! · Bright lovely interactive presentation. · Not really something I am interested in but very good + interesting all the same. · Interesting – very practical tips. · Didn’t really interest me. · Well presented. Not convinced can be applied in an EA role. · Veronica gave me food for thought on how to implement mind mapping in the work place. 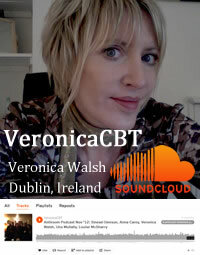 · Found Veronica very engaging and easy to listen to. · Interesting presentation + useful hints. · I’ll youtube Mind mapping. · Excellent tool that I will definitely be using. · Will try but not sure I will understand the practice. Could also be great as a tool activitry. · I found the mind mapping very useful. · Really relevant and helpful for future meetings. · Spot on. I will be using this technique going forward. · Love this section – would have liked her to speak for longer. · Made me aware of mind mapping – must try it. · Excellent + would have liked more time listening to her. · Excellent – loved this session. · Well presented + interesting topic. · Very engaging, funny and found the talk very useful and something I will certainly put the mind mapping to use!